We are just starting out, so not all of these programs are polished, but we are more than happy to get started with you! So if you are interested, give us a call, email, or try telepathy (but please follow up if we don’t get the message!). Besides organizing community cleanup events throughout the year, we are committed to getting our hands dirty and picking up trash all year long. Our volunteers are dedicated to cleaning up the environment 365 days a year and we will take it to the streets through our mobile efforts to reach the entire country with our message. Don’t hesitate to let us know if you have a specific project in mind. Trash is a threat to wildlife, and a cause of pollution through runoff and off-gassing. It’s our duty as environmental stewards of the earth to pick it up. Let’s have some fun, if you’re up for the challenge! As Environmental Scavengers roams around decomposing tasty morsels of leftovers (trash! ), you can support the process by pledging to donate for each tire we collect. Contact us for more details! An important part of our work is educating the community on information pertaining to the environment, as well as problems and possible solutions. 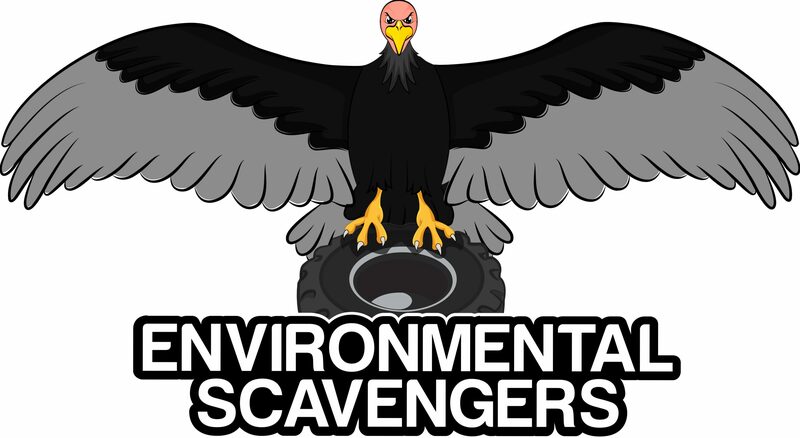 Contact us if you would like an Environmental Scavengers representative to speak at your business or event! We would like to help you make your business more sustainable. Through a series of certification programs formatted for a variety of businesses, we will assist you in taking the steps necessary to lighten your environmental footprint. Once the criteria for the program are met, we will provide you with a certificate and sticker to show off your success. No doubt it will bring your establishment more business as consumers increasingly seek establishments who are doing their part. A little healthy competition can always bring folks together and that’s why we’ve created the Environmental Scavengers Scavenger Hunt! Teams or individuals will pair up to find trash at a particular site. Points will be scored for finding big and small items. Small items can be gathered en mass to keep up with the big item scavengers! We will announce scavenger hunt locations and times on our website and our Facebook page so keep a look out! Urban sprawl is an issue facing the entire planet. There are many ramifications of urban sprawl including a loss of green space leading to an inability for animals to migrate safely, a reduction in land for producing food, and an overall decline of the ecosystem. In our budding Green Space Program, we’ll seek to transform unproductive land into green space. This newly greened land could then be used for community gardens, nature preserves, and more. Contact us for more information if you are interested in donating for this specific project.